After putting together all the pictures in this post I realise Erena and I have a thing for chandeliers! But I couldn't do this post without them. They are the classic high end formal factor in an interiors situation, kind of like a pair of high-heels for an outfit, a chandelier instantly dresses up a room. Above we've paired a somewhat unlikely combo of Nike high-tops with a dress, the formal dress with the informal shoes may not have been a natural combination for some but it works in a youthful, fun, not to mention comfy combo. And equally who would have thought that putting a chandelier in a bathroom was just so right! You don't have to be strictly guided by what is "appropriate" in a room or for an outfit. Check Sarah Jessica Parker's soft flowing pink evening gown that is edged up with a biker style black leather jacket. We've matched it up with this interior pic that is a mix between an industrial building with cold metal and concrete, which is then beautifully complimented by the soft, plush pink furnishings. The juxtaposition of the hard and soft in this interior shot work particularly well to keep the room modern, edgy and functional, yet at the same time warm and inviting. This is Delmy from Fashion Bananas and she looks incredibly cute with this high and low combo polka dot dress and sneakers. An elegant chandelier is a surprising and fun accessory in a typically non-glamorous room - the laundry. 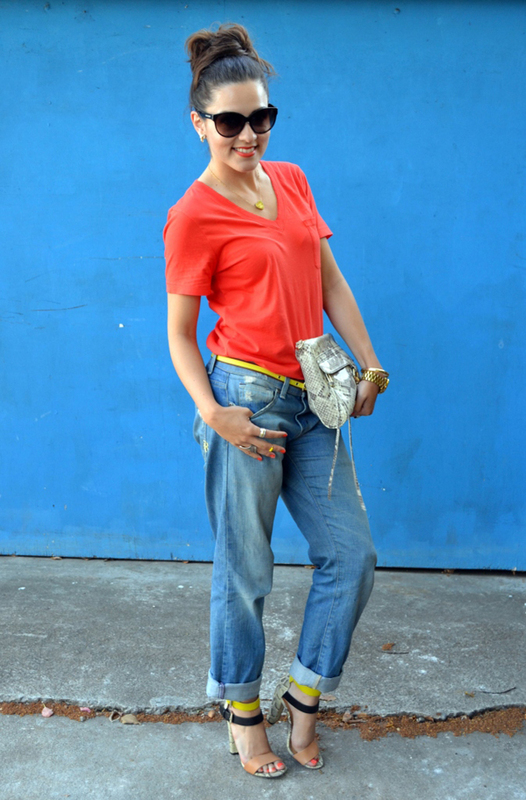 Maria Morales is one of my favourite bloggers, she has fantastic style and is an expert in juxtaposed styling. Below are a few of my favourite pics where she has mixed casual jeans with dressy heels. We hope that this post inspires you to not be afraid to mix elements of your wardrobe and interiors in non-traditional ways. Don't be locked into the idea of "this dress goes with these shoes" or "this jacket has to be worn with this top". You can wear sneakers with a dress, or high heels with a shabby pair of jeans, or a black leather biker jacket with an evening gown... there are no hard and fast rules, so have fun and mix it up. Thanks so much for including me in this post! Completely agree--it's fun to mix it up and do something a bit unexpected!